Learn about the Fresno Younger Member Forum and our cabinet members! To provide opportunities for the Fresno younger members to connect within, outreach to our community, and bridge the gap between students and professionals. Fresno YMF was revived in 2009, starting with only 4 members! They put in many hours of hard work brainstorming and recruiting to make this YMF the successful organization it is today. We aren't the largest YMF, but we are active! Check out our events page to see some of the many events throughout the year. Our events include: community service volunteering, professional and student outreach, and socials. ​Fresno YMF is part of the San Francisco Section in Region 9 of the American Society of Civil Engineers. To the left is a pictorial representation of our region, section, and branch. 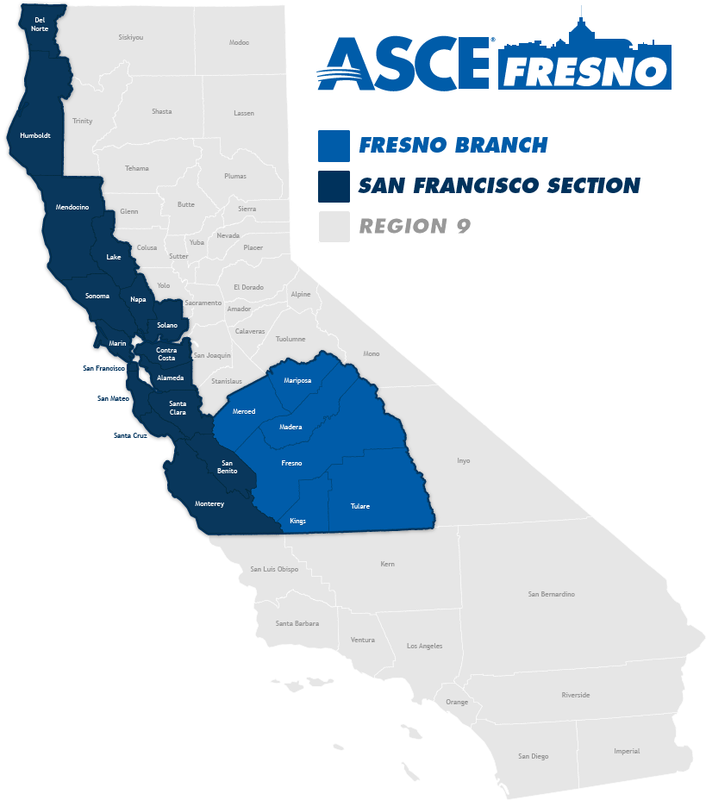 Region 9 is the only ASCE geographic region that encompasses only one state, California, due to its size and the number of members. Fresno is one of 12 Younger Member Forums in Region 9. Younger Members are ASCE members who have graduated from their student chapters and are age 35 or younger. ASCE recognizes that we make up the future of the profession and provides opportunities to help us make friends in the profession, grow our careers, and develop as leaders in our communities. For more information about younger members, visit the ASCE Younger Member Webpage.